Definition: The bombing of a small town in northern Spain by units of the German Condor Legion during the Spanish Civil War (1936-1939). Significance: An operational test of the German Luftwaffe’s strategy of Blitzkrieg, the bombing of Guernica created an international outcry and was also a portent of the mass bombings of civilians during World War II. On April 26, 1937, Guernica, a Basque town in northern Spain with a population of about 7,000 people, was almost totally devastated. Fire and explosions destroyed most of the town’s wooden houses, its two hospitals, and its surrounding farmhouses and village areas. Many civilians were burned to death in their houses, while survivors who ran into the streets were machine-gunned to death. Among the few structures that survived unscathed was Casa de Juntes, the repository of a valuable historical archive. The church of Santa Maria was largely untouched, as was the famous Guernica oak tree, where the kings of Spain had traditionally taken an oath to respect the rights of their subjects, who in turn pledged their allegiance. The destruction of Guernica became one of the most famous events of the Spanish Civil War, in which a Republican government consisting of parties on the Spanish Left was challenged by the conservative Nationalist armies of General Francisco Franco. The civil war continued the century-old struggle between monarchists and republicans in Spain. King Alfonso XIII had left the country in 1931, and in the 1936 elections, a Popular Front of socialists and other leftist parties had taken parliamentary control. There were fears within the Spanish military that the Popular Front was a communist-supported political device that might introduce communism into Spain. In response to the anticlerical traditions of the Spanish Left, much of the hierarchy of the Spanish Catholic Church also opposed the Spanish Republic. In July, 1936, General Franco, commander of Spanish troops in Morocco, assembled a Nationalist force to oppose the Republic. This began a civil war in which much of the Spanish army, landowners, businesspeople, and the Church opposed the Republic, while agricultural workers, urban workers, and portions of the middle class supported it. Also siding with the Republican government were many Basques who, although one of the most devoutly Catholic segments of the population, had historically sought independence. The war, seen by some as one of fascism versus communism, drew assistance from a number of other countries. The Republicans drew volunteer fighters from a variety of nations, including the United States and the Soviet Union. Nazi Germany and Fascist Italy supported the Nationalists, although Franco discouraged discussion of this fact. In military terms, the most significant aid from Nazi Germany was some 50,000 troops of the Condor Legion, a unit of the German Luftwaffe, or air force, assigned to fight in the civil war. Hermann Göring, chief of the Luftwaffe, sent the Condor Legion on the condition that it would remain under German command. Although Nationalist leaders denied it, it was at their request that Nazi Germany had sent the Condor Legion. Although the Legion included tanks and antiaircraft batteries, its main value in the Spanish Civil War lay in its air power, consisting of four bomber squadrons of twelve bombers each, plus four fighter squadrons. It was the most powerful air arm ever assembled, exceeding the firepower of the combined air forces of World War I (1914-1918). Even the international press took sides. British newspapers gave wide coverage to the incident, but some European newspapers were slow to report it. Others virtually ignored the incident, and in countries such as France, where there were fears that the war might spread into other parts of Europe, press reports sometimes reflected the editors’ political inclinations. Some accepted the Nationalist claims that Guernica had been vandalized by Republican forces. In the United States, press reports of the destruction appeared quickly, even in those newspapers, such as those of the Hearst chain that had editorially thrown their support to Franco. In their book Guernica: The Crucible of World War II (1975), Gordon Thomas and Max Morgan-Witts reported on the results of examination of archival files in Freiburg, Germany, and of interviews with more than forty survivors of the Guernica disaster and some dozen surviving members of the Condor Legion. Although many records were destroyed in World War II, the family of Wolfram von Richthofen, a cousin of Manfred von Richthofen, the famous “Red Baron” of World War I, and one of the commanding officers of the Condor Legion, allowed Thomas and Morgan-Witts to examine von Richthofen’s papers. The authors concluded that German planes had indeed attacked Guernica and that some of the key decisions leading to the attack were made by von Richthofen. Although he was not an admirer of Göring, von Richthofen had accepted Göring’s offer of a planning position in the new German Air Ministry during the 1930’s. Responding to a personal appeal from Franco, German chancellor Adolf Hitler had pledged to aid the Nationalist cause. Shortly after the Condor Legion arrived in Spain in late 1936, von Richthofen was appointed chief of staff. He was especially interested in the idea of sudden, overwhelming air attacks delivered with speed and precision, attacks that would later be known as Blitzkrieg. The Spanish Civil War became an opportunity for the Germans to test such theories of aerial warfare. In March, 1937, General Emilio Mola, commander of the Nationalist armies in northern Spain, began a campaign against the Basque strongholds in that part of the country. Some 50,000 Nationalist troops participated in the campaign against Republican forces greatly weakened by an inability to buy arms and ammunition abroad. As Republican forces retreated, northern towns such as Guernica became filled with refugees and retreating soldiers. The normal population of Guernica swelled by several thousand. Von Richthofen, responding to reports of Republican troops retreating from Vizcaya toward Bilbao, identified as a possible target a bridge that the troops would have to cross, the Rentería Bridge in Guernica. Meeting with Spanish field commanders and representatives of the Italian air force in Spain, von Richthofen emphasized that the retreating Republican forces had been slowed, if not halted, in the narrow canyons approaching Guernica, creating a bottleneck that provided bombing opportunities. Von Richthofen’s immediate superior, General Hugo Sperrle, who had criticized the effectiveness of Nationalist forces, viewed bombing as away to compensate for the deficiencies of his Nationalist allies. The degree of Nationalist complicity in, or advance knowledge of, the bombing of Guernica remains unknown. Before planning the attack in detail, von Richthofen met with Juan Vignon, General Mola’s chief of staff. Although there appears to be no detailed record of the conversation, von Richthofen is quoted as saying “Anything that moves on that bridge or those roads can be assumed to be unfriendly.” When the town of Durango had been bombed by Legion planes on March 12, 1937, it had been on Sperrle’s orders. At that time, von Richthofen had posted a memorandum noting that while targets were always military, bombing might be done “without regard for the civilian population.” Sperrle, however, expressed unhappiness at the degree of civilian causalities at Durango, including fourteen nuns killed in their convent. Mid-July, 1936: The Spanish Civil War begins. Late July, 1936: The first units of the German Condor Legion arrive in Spain. March 31, 1937: Nationalist General Emilio Mola begins a military campaign against Republican armies in northern Spain. April 25, 1937: Condor Legion chief of staff Wolfram von Richthofen formulates plan for attack on Guernica. April 26, 1937, 3:45 P.M.: Condor Legion planes leave airports in Vitoria and Burgos for the attack on Guernica, with the Rentería Bridge as the purported target. For the three-hour attack on Guernica, a force of 43 bombers and fighters was assembled on airfields at Vitoria, some 50 miles away, and at Burgos, more than 120 miles away. Together, these planes would carry 100,000 pounds of incendiary, shrapnel, and high-explosive bombs. Among the planes selected for the mission was the Junkers Ju-52 bomber, considered less accurate because of its outdated bomb sights and because its spherical bombadier’s chamber had to be lowered from the floor of the airplane for bombing runs, contributing to instability. Although six Heinkel He-51 fighters participated in a diversionary attack on the town of Munditibar, the primary target of the day was Guernica. An experimental squadron of new Heinkel He-111 bombers, more maneuverable than the Ju-52 bombers and able to deliver incendiaries at 200 miles per hour, was regarded as too valuable to be used as the main force in the bombing. The Heinkels acted instead as pathfinders. 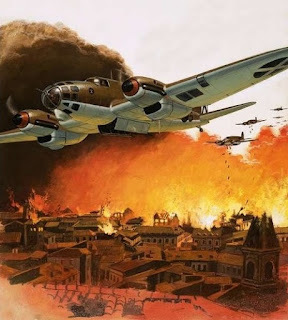 The commander of the experimental squadron, Rudolf von Moreau, flew over Guernica in a new Heinkel bomber first, dropping his load of bombs on the Rentería Bridge after determining that there were no antiaircraft defenses. After this run, he joined the remainder of the experimental squadron for a bombing run over the town. They were protected by six Messerschmitt Bf- 109 fighters. A squadron of Messerschmitt fighters also provided protection for the Ju-52 bombers, the central wave of the attack, forming a protective umbrella above them. The Junkers bombers attacked in waves with a one-mile gap between them. They bombed in chains of three aircraft and flew in “V” formations at an altitude of about 6,000 feet, a height that would likely cause a large number of misses. To maintain the element of surprise, the bombers approached the bridge from the side, rather than straight on. This mode of attack convinced many on the ground that the civilian casualties were not accidental. In fact, on the Republican side, much attention was given to a photograph of the first run of Junkers bombers approaching Guernica, taken by Father Eusebio Arronategui of Guernica. The photograph, which shows Junkers bombers approaching three abreast, was regarded as evidence that civilians, and not the narrow Rentería Bridge, were the main target. After passes by the bombers, the Messerschmitt fighters returned and attacked Guernica. One eyewitness said he saw the Messerschmitts flying north to south through the town and “firing all the time.” A squadron of He-51’s carried out low-level attacks using machine guns and dropping smaller bombs. When a member of the Condor Legion complained about the use of incendiary bombs, he was told that von Richthofen wanted the mission to proceed, and quickly. 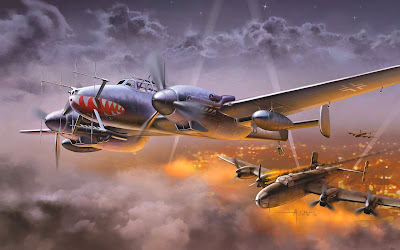 The choice of the relatively inaccurate Junkers bombers, the bombing heights utilized, and the high amount of explosive power sent on the mission, 400 pounds for every square yard of the target bridge, later raised questions about the lack of concern shown for damage to civilian centers. Interviewed thirty-seven years later, some members of the Condor Legion insisted that they did not know that Republican troops were present in Guernica and that their bombs were sent off target by unexpectedly high winds. Many survivors disagreed, insisting the lack of wind allowed them to contain some of the fires. It is known today that a valid military target, the Unceta Munitions Factory, was operating within Guernica, but the management of the plant was so pro-Franco that Republican soldiers had been posted throughout the plant to keep an eye on production. There appears to have been no discussions about the plant among the German pilots. Upon their return to Germany in May, 1939, the troops of the Condor Legion were greeted personally by Göring, who announced that the “volunteers” would receive medals. In June, the entire force, some 15,000 strong, paraded through Berlin, led by von Richthofen and Sperrle. Hitler, in a welcoming speech, hailed the “heroes of Spain” for “teaching a lesson to our enemies.” Von Richthofen, who participated in German air attacks against Poland in 1939, became, at 47, the youngest field marshal in the German air force. Captured by Allied troops in southern Germany in 1945, Sperrle was among the Nazis included in the war crimes trials at Nürnberg in 1948. When a former Basque minister of justice, Jess Leizaola, asked that the bombing of Guernica be added to the list of charges, the tribunal refused, insisting that all charges be confined to activities during World War II. Sperrle eventually was acquitted of all charges against him. At the trials, Göring commented that the Spanish Civil War had been an opportunity for him to “try out” his new air force. The bombing of Guernica became the single-most famous event of the Spanish Civil War. Although other Spanish towns were bombed during the war, Guernica created a special controversy. The apparently systematic destruction of a town that was seen mainly as a communications center served as a precursor of World War II bombing policies and treatment of civilians. Because the town itself was of questionable military importance, the event came to be viewed as an attempt to terrorize civilians, particularly the Basques. Although the incident underlined the extent to which Franco’s German and Italian allies were involved in the war, the Spanish general reportedly would not allow the subject to be discussed in his presence, at least not in public. When, in 1937, the Spanish artist Pablo Picasso was asked by the Spanish government to contribute a work for the country’s pavilion at the Paris Exhibition, he entered Guernica, a melange of distorted and grotesque faces, bodies, and animals that was viewed as a condemnation of both the bombing and war in general. Picasso’s work guaranteed that the name “Guernica” would not fade into memory. Southworth, Herbert Rutledge. Guernica! Guernica! A Study of Journalism, Diplomacy, Propaganda, and History. Berkeley: University of California Press, 1977. A detailed and thoroughly documented volume focusing on the continuing debate over the truth about Guernica. Includes much information on the newspaper coverage of the event. Thomas, Gordon, and Max Morgan-Witts. Guernica: The Crucible of World War II. New York: Stein and Day, 1975. A highly readable narrative that mixes the personal memories of many Guernica survivors with accounts of military leaders over strategy. Its conclusions, that the Condor Legion attacked Guernica partly as a test of bombing tactics, are based heavily on eyewitness accounts and interviews. Thomas, Hugh. The Spanish Civil War. New York: Harper &Row, 1977. The standard work concerning the events before and during the Spanish Civil War and a balanced and dispassionate account. The author believes that Guernica was attacked mainly because of its value as a communications center for Republican armies. He also discusses the efforts of the German government to cover up their involvement after an international outcry over the bombing.